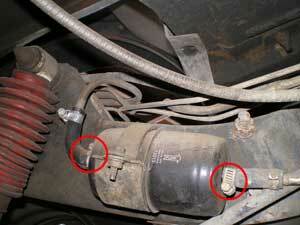 This is the location of the fuel filter in my '95 Jeep Wrangler. The view is from the back, driver's side. 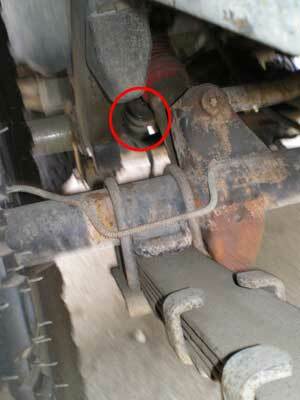 The best way to get to the fuel filter is to get under the Jeep from in front of the back driver's side tire. It is mounted on the inside of the frame. Buy the fuel filter picutred above by clicking here. You will have to loosen the straps of the fuel filter by using a flat head screw driver on both sides of the fuel filter. Unscrew the strap in the middle holding the filter to the frame. Once the straps are loose, get out the the way, because some gas will leak when you pull the filter out. Pull the tubes off of each side of the fuel filter and replace it with a new one. This is sometimes hard to push the tubes on, but they need to be al the way on in order to avoid leaking gas. Make sure you have it facing the right way. There should be arrows as in this image above on the right half or pointing toward the engine.